Roy Schneiderman, CRE, FRICS, founded Bard Consulting in early 2001 to provide strategic real estate counsel to clients throughout the real estate industry. Roy has been providing real estate consulting services to clients including financial institutions, pension funds, property owners, developers, law firms and public sector entities since 1983. Particular areas of expertise include real estate investment analysis, transaction negotiation, development feasibility, real estate investment strategy and litigation support. He has analyzed properties valued in excess of $4.0 billion throughout the United States. Prior to founding Bard Consulting, Roy was Principal and Senior Managing Director with Sedway Group/CB Richard Ellis. He had previously spent four years as a real estate consulting manager with Deloitte & Touche, an international accounting and consulting firm. Before Deloitte & Touche, Roy worked for Keyser Marston Associates, a regional real estate consulting firm headquartered in San Francisco. Roy has lectured on real estate issues at the University of California at Berkeley and the California Redevelopment Association Institute. Joel Kotkin is a significant persona and one of the more prolific writers on the non-politically correct side of the “urbanism” debate. The Human City: Urbanism for the Rest of Us puts him once more into the fray. By way of full disclosure, I am generally sympathetic to Kotkin’s positions, but have found his body of work to range from the insightful and thoughtful on one hand, to the simplistic and formulaic on the other. This book lands somewhere in the middle. It presents plenty of interesting insights as well as many statistics you won’t find in the popular press. But The Human City is also an eye-glazing narrative of statistics and stories with nary a single chart, table, map or picture in its 201 pages. This makes for a difficult and unexciting read. The book is clearly well-researched, with over 1000 footnotes and a 55-page bibliography. But as noted in the “Acknowledgements,” the book was born from a magazine article and it retains the “magazine article” feel from beginning to end, flitting quickly from section to section, idea to idea, but never reaching the levels of substance that Kotkin has achieved in other works. I found myself constantly tracking down his sources (which was thankfully made very easy to do), but wished I did not have to. The Human City is written from the perspective of someone who wants to “take on” the urbanist orthodoxy and it does a pretty good job of it with an array of statistics and anecdotes. But only rarely does the book actually provide a clear articulation of the orthodoxy and present a systematic refutation. The Human City presents an array of data throughout its pages demonstrating that in general, as population density increases, birth rates decline. This is a fascinating topic. Why are people less likely to have children in denser urban areas? Has it always been this way? Is this changing? Might it change in the future? Is it primarily related to school quality? Do parents perceive children need more open space and nature than most cities can provide? Will that change? There is a long list of interesting questions. I was very much looking forward to a discussion of these issues and potential answers to these questions. The book teases, but ultimately fails to deliver this thoughtful discussion content, electing instead to pepper the reader with isolated data-points. For example, while dense-and-getting denser Tokyo is noted for its low birth rate, it is not compared with the de-densifying rest of Japan. More generally comparing and contrasting areas with below-replacement level birth rates with places with above-replacement level birth rates could have been very instructive. A second major theme of The Human City is that having people crowd into megacities is not necessarily a good outcome. In particular, Kotkin argues that megacities tend not to be incubators of economic growth or a thriving, family-friendly middle class. 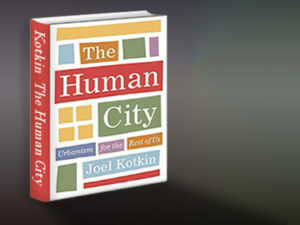 An entire chapter is devoted to this issue and Kotkin takes full aim at the thesis that urban density is per se a good thing by providing substantial statistical data showing that dense, but poor, cities are … poor, lacking in economic opportunity, and not necessarily very pleasant places to live. Examples of megacities include Jakarta, Dhaka, and three urban areas in India. In fact, “There were 34 such cities in 2014, which now account for roughly 13 percent of the world’s urban population and 7 percent of the world’s total population.” But here again the book teases but only partially delivers. The 34 megacities are not identified, nor is the definition of megacity ever presented. In fact, I found it somewhat startling that only 7 percent of the world’s population lives in its 34 largest cities, but this observation was not explored. The “megacity” chapter of The Human City does a nice job of demonstrating that large, dense cities have plenty of problems and that “poor” large, dense cities are, for the most part, not appealing places to reside. And the book fails to compare and contrast urban successes and failures with an eye towards accentuating the positive while minimizing negative elements. Kotkin has no issue with those who want a “live, work, play” environment in a high-density neighborhood, but he has an issue with those who either predict or advocate a more atomistic, individualistic future with small households living in small, high density units. He marshals ample statistics that demonstrate the majority of people in America do not conform to this model. In fact, most U.S. population growth has occurred in neighborhoods that do not fit the urbanist orthodoxy, although, starting from a small base, there have been recent years when center-city growth rates have actually outpaced suburban growth rates. The situation is a bit less clear cut globally, but on the whole Kotkin’s position here is also well-supported. Rather, The Human City suggests a) people are complicated with diverse desires, b) people’s preferences often change over time and c) people ought to have many living arrangements from which to choose. Of course, few people would disagree with these ideas, although, at the margin, there are certain orthodox urbanists who might take issue with each. First, and less prevalent, are those that acknowledge the heterogeneity of housing desires today, but attribute this to some external, sometimes sinister, force that is directing people unnaturally toward suburbia and away from the particular branch of urbanism they espouse. Secondarily there is the claim that maybe people wanted “suburbia” in the past, but “this generation is different” and now all roads point to a high-density future. Kotkin has little patience for either presenting on “I know what is best for you” paternalism or a “this generation is different” hypothesis. The Human City repeatedly and reasonably, makes the claim that people ought to be able to choose the type of housing and living arrangement that is most appropriate for themselves at different points in their lives. But the book fails to make the case to support that claim. Questions as to why some people might prefer “X” to “Y” or “Z” are not deeply explored. And thoughts about how to possibly get “the best of both worlds” in urban, suburban and exurban environments are not particularly well developed. This is probably the most frustrating thing about the book. The title The Human City: Urbanism for the Rest of Us promises such discussion but only occasionally delivers.